The Tide Eco-Box arrives on a shopper's doorstep in a sealed, shipping-safe cardboard box. Inside the box is a sealed bag of ultra-compacted Tide liquid laundry detergent. To use, a perforated cardboard flap is peeled off to reveal a dosing cup and a new "no-drip" twist tap. To make dosing simpler on flat surfaces, the box includes a pull-out stand to raise the height of the box so the cup fits easily beneath the tap. The name "Eco-Box" is a nod both to eCommerce and the lighter shipping footprint these packages are designed to drive. Products sold online typically need to be packaged with a second or third layer of packaging like cardboard boxing and bubble wrap that's then discarded by the consumer. To address this, P&G designed the Tide Eco-Box to ship as efficiently as possible on its journey from a manufacturing site to a retailer's warehouse to a consumer's front door. "We know that the ‘last mile' remains the biggest challenge both economically and ecologically in eCommerce," said Isaac Hellemn, Brand Manager for eCommerce innovation in P&G's Fabric Care group. "The Tide Eco-Box is designed to keep the convenience of online shopping for the consumer but reduce the overall impact of that convenience on our environment." 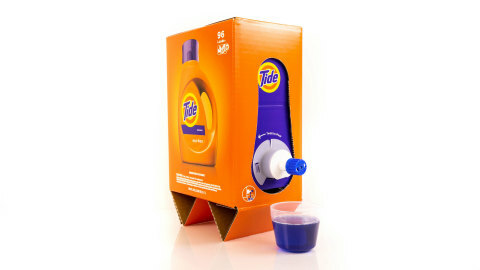 The Tide Eco-Box is the first product launch from P&G Fabric Care's eCommerce Innovation Group. "For the first time, we have designed a package ‘eComm-Back,' beginning with the unique challenges and opportunities the eCommerce environment presents," said Sundar Raman, Vice President of P&G's North America Fabric Care business. "This is a fundamentally different approach than we've taken in the past and represents our relentless obsession with delighting consumers – wherever they want to purchase our brands." P&G will continue to innovate in the ecommerce space as it adapts its product offerings for the channels its consumers are shopping. "We have some pretty exciting ecommerce projects we're working on, and that shouldn't be surprising," says Isaac Hellemn, "eCommerce isn't a trend anymore, it's a reality, and we're excited to keep innovating for it."